It is a Lebanese bread had with Hummus, Salad and Falafel... it's better to make these at home. Easy to make even if you don't have a oven. Add yeast, sugar and water in a bowl and let it proof for 10 minutes. Add 2 1/2 cups of the flour and salt and mix it well. When the yeast is ready pour the yeast on the flour. Mix the dough well. If required add more water little at a time and start mixing the flour and kneading it into a soft dough. Add a tbsp olive oil and knead it for 5 minutes. Drizzle some more oil on the dough. Cover the bowl with a towel and let rest until it rises double its size. 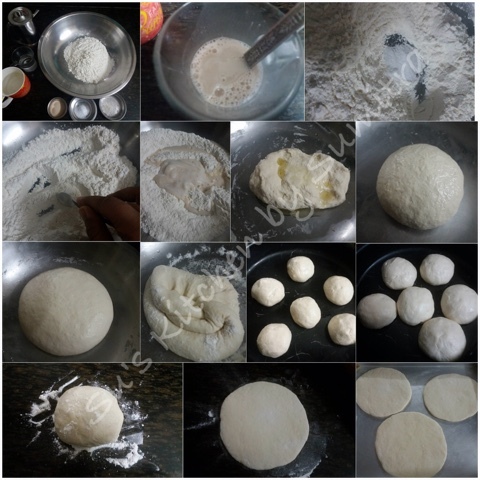 When the dough is ready, sprinkle some flour on the dough and remove the air from the dough. Knead it again for few seconds and make 6 equal portions of the dough. Arrange the balls on a greased tray leaving some distance, cover and let it rest for 10 minutes. With a help of a rolling pin roll out each ball into a 1/3 inch thick circle. Let the dough circles rest for 10 minutes. While rolling the dough,heat the oven to 260 degrees celsius and preheat it. Put a baking tray on the middle rack to heat. Put as many rolled out pitas that fits on the baking directly for about 3 minutes. 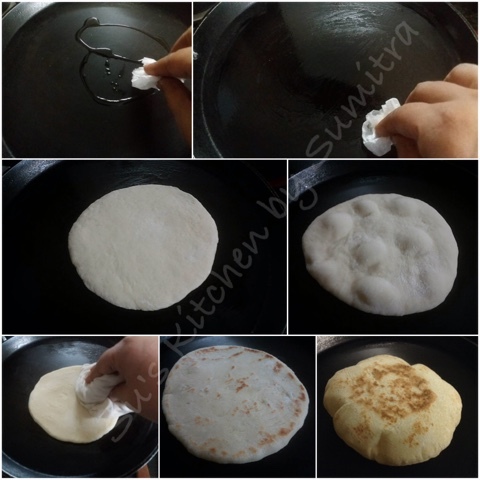 The pita will start to puff up after two minutes and is done when it has fully ballooned. Cover baked pitas with a towel while cooking any remaining pitas. Warm a cast iron skillet over medium-high heat. Drizzle a little oil in the pan and wipe off the excess. 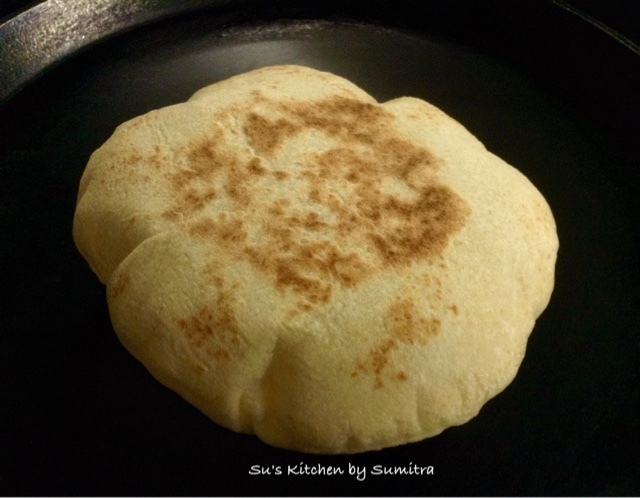 Put the rolled-out pita on the skillet and bake until you see bubbles starting to form. Flip and cook for 1-2 minutes on the other side, press the surface gently with a towel. Flip again and cook another 1-2 minutes. The pita should start to puff. 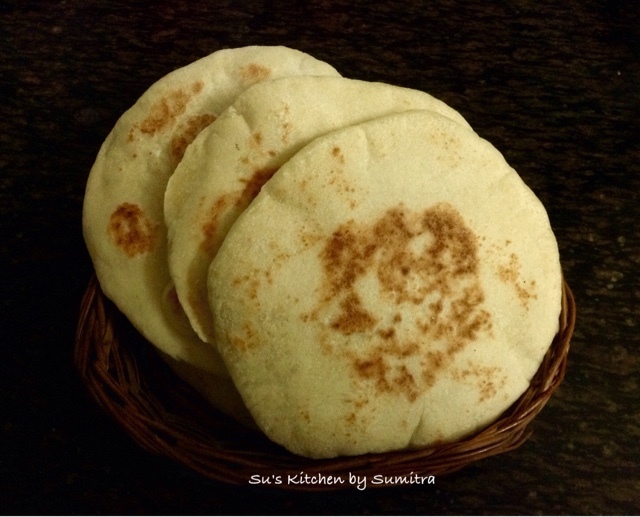 Keep cooked pitas covered with a clean dishtowel while cooking the remaining pitas.